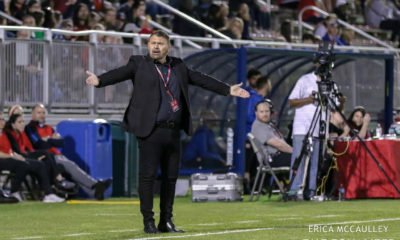 The National Women’s Soccer League was forced to postpone the only match on the schedule last week when Sky Blue FC’s flight to Chicago was cancelled in the midst of horrendous storms in New Jersey. Twelve hundred miles to the south, at Hard Rock Stadium in Miami, the league was making its first foray onto the international stage. The International Champions Cup, an extravagant series of exhibition matches pitting some of the top European sides in cities around the world, added a women’s event for this its sixth season. Four teams were involved — French foes Olympique Lyonnais and Paris Saint-Germain, English power Manchester City, and the North Carolina Courage. 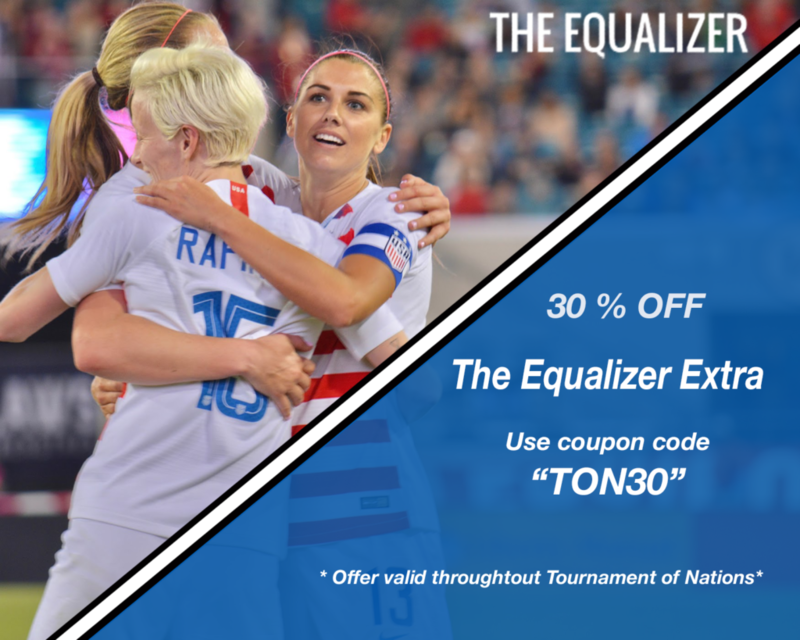 The problem for the Courage was always going to be that so many of their players were ticketed to be with the United States national team for the Tournament of Nations. And that was before McCall Zerboni and Merritt Mathias joined the international party, though Lynn Williams didn’t get the call this time. European teams, of course, are in preseason mode. With those realities for context, the Courage edged PSG in their opening match, and then rode an early Heather O’Reilly goal to an unlikely, 1-0 win over Lyon to take the crown. “We’ll go down in the history books as winning the first ever. So there’s something to be proud of for that,” O’Reilly said in comments published in the Sun Sentinel. O’Reilly added that she did not think her 10th-minute goal would stand up as the only one of the evening, and not often does a team out-possess its opponent by better than 70-30 and not manage a goal. But in this case, the single goal was enough. 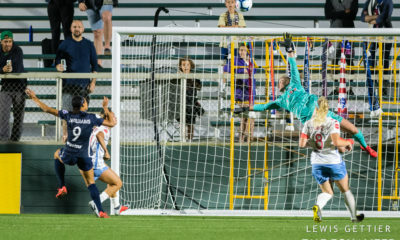 Goalkeeper Sabrina D’Angelo, in her first action since May 6, made one extraordinary save off a deflection in the box, and the post and crossbar both helped keep Lyon off the board. It is difficult to believe that anyone who watched the final came away believing the Courage were or are the superior side. And Lyon was in preseason mode, although the starting XI they trotted out is without peer. So the debate can rage forever about whether the Courage’s win was more impressive because they achieved it without their midfield engines McCall Zerboni, Debinha, and Crystal Dunn — plus Sam Mewis and Abby Dahlkemper — or whether the win should be downplayed because of their opponents’ relative lack of fitness and match sharpness. The reality, as it almost always is, lies somewhere in between. Make no mistake, though, the Courage win over Lyon — a team that very rarely loses no matter the time, place, or competition — is a big deal. The first sign was seeing what appeared to be an emotional Paul Riley celebrating after the match. Another was this scene back in North Carolina. 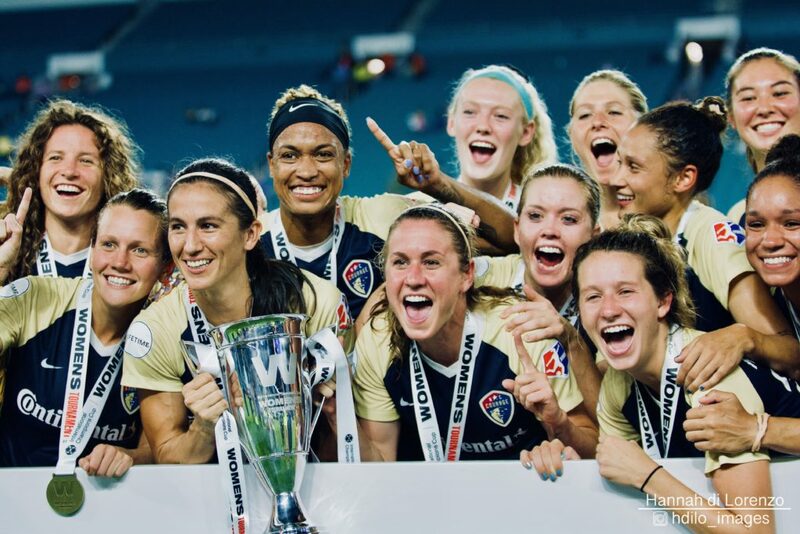 The ICC trophy will be on public display at Sahlen’s Stadium this Sunday, with a chance to grab another one — the NWSL Shield. As American players filed out of their locker room after their 1-1 draw with Australia on Sunday, each of them knew the score and approximate minute of the match. 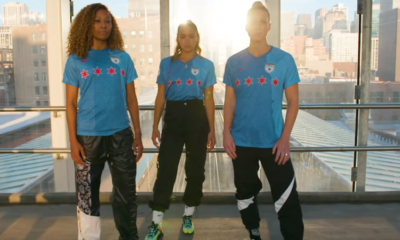 “Yes actually,” Emily Sonnett responded when asked if she was a Courage fan in that moment, though it was clear she was not thrilled to admit to the fact. The dream is for a legitimate, global competition for women’s club teams to emerge sooner than later. There are myriad issues with doing this. The ICC model on the men’s side is a series of high-end exhibitions. The women’s mini tournament was handled differently, so perhaps an expanded ICC that looks different from the men’s event could work. But not in the summer. The preseason argument for the European clubs is real. NWSL clubs already cram their matches into a tight window which makes playing it difficult to play a global tournament around the traditional European calendar. The Club World Cup is contested between eight men’s sides every December, which would literally eliminate NWSL teams from participating (Australian teams would likewise be near impossible to play outside their brief season), and besides that has rarely grabbed the attention of the world. There is also the matter of qualifying. The ICC is an invitational and the brand of gear a team uses can and does go a long way toward receiving that invite. If I had to guess, somewhere in the world, an enterprising soccer can with connections to money is plotting out a way to do this. And that Courage win over Lyon only served to stoke those flames that everyone hopes will soon lead to a proper international club tournament for women. — The Courage win was tempered by the first-half injury to Yuri Kawamura. The Japanese midfielder was just getting herself back to match fitness following an injury that cut her 2017 season short. The Courage have not released any information on Kawamura since returning from Miami. — The Red Stars-Sky Blue match is now scheduled for September 4. The U.S. national team plays Chile that evening, but the NWSL match kicks at 7:30 p.m. EDT and the U.S. at 10:00 p.m. EDT. And while not having the U.S. players for the match is hardly ideal, they weren’t going to be there on the original date, either. The Red Stars should have Sam Kerr, who was not going to be available last weekend. — Jaelene Hinkle being called into Tournament of Nations camp, only to be sent home (with Kealia Ohai) before the final roster was set, is another strange twist in her story. My short logic is that once you call her to camp, then you’re agreeing to put her refusal to wear the rainbow numbers to bed. Is it possible that she went to camp and the tension was so high that Jill Ellis decided her presence was untenable? Sure, but that’s neither likely nor consistent with any rumblings. Did she just play so poorly that it was impossible to take her — giving her more practice time — as one of the 23, even though she plays the position that has the least depth? One can only hope there is not more to it. Ellis said before Sunday’s match that she made the decision based purely on soccer. — As an aside, regardless of individual situations, it always strikes me as cruel to take 25 players with the intention of taking 23 to the tournament. I’d rather see seven cut than two. 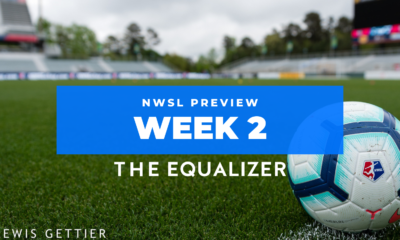 — Could the Orlando Pride become Sky Blue’s first victim of the season on Sunday? Pride coach Tom Sermanni gave his team some downtime last week and is hoping it does them some good. They are miles better than Sky Blue, but some tired Tournament of Nations participants and the team’s penchant for walkabouts late in matches is concerning.